Danny lives with his father, they are not well off, in fact, they are quite poor. All the land around them belongs to a horrid man named Mr Victor Hazell. One day Danny and his father hatched a plan to teach Mr Hazell a lesson that will shock him and on he will never forget. You see Danny's father is a poacher and like to poach the pheasants on Hazell's land. Danny and his father hear that Mr Hazell is having a private shooting weekend on his land and decide they're not going to let this happen. When the two of them put their brilliant minds together they hatch an amazing plan to steal all the pheasants off Mr Hazell's land before the shooting party begins. What troubles will the two get into and can their plan succeed? What will happen when Mr Hazell discovers what they've done? As a child, this book was along side Matilda my all time favourite book. To this day and at the age of well almost twenty-seven I still love to read this book. I will always love Dahl and all his book and I now have them on audio book which is amazing as I get to listen to them too. I have said this before in previous reviews about Dahl's books but I shall say it again, I love how Dahl shows how children can be just as smart if not smarter than adults. 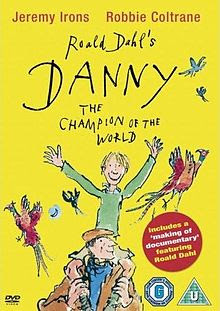 Danny Champion of the World is a wonderful story and shall be loved for many generations to come and I can't wait till I have children of my own and can pass on my love of Roald Dahl to them. Of course, this book gets a five-star review as all Roald Dahl books deserve.